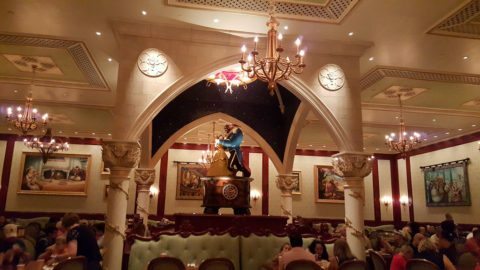 Many guests at Walt Disney World in Florida are checking out the Be Our Guest restaurant, a new full-service dining experience at Magic Kingdom based off the 1991 Academy Award-winning animated Disney film, Beauty and the Beast. 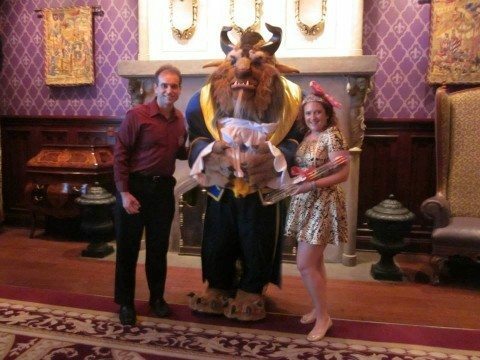 When I went to make Be Our Guest reservations to propose to my now fiancé at this restaurant (Beauty and the Beast is her all-time favorite movie), I quickly learned that this place regularly has a 6-month waiting list! I didn’t need 6 months to make reservations. In fact, I scored my reservation only days before I popped the question at Be Our Guest. Using a few tricks, I was able to get a reservation, and I will share these tips with you below so that you, too, can enjoy this unique Disney restaurant. Believe me, it is worth the trouble. What’s The Hype About Be Our Guest Restaurant, And Is It Worth It? You might be wondering what all the fuss is over the Be Our Guest restaurant. It isn’t like any other Disney restaurant. Be Our Guest takes Disney theming to a whole new level. Located inside the newly revamped Fantasyland, Be Our Guest is based inside the Beast’s castle, and every last inch of this place is faithfully themed according to details from the movie. The main dining hall is themed around the grand ballroom that fans of the movie will instantly recognize as the place where Belle and the Beast danced to the movie’s eponymous theme song. The floor-to-ceiling windows look out on a wintry mountain scene, complete with snow falling behind the glass. Take my word for it, you will forget you’re in Florida when you’re dining in the grand ballroom! The West Wing is a much darker area with claw-marked portraits, tattered curtains, and a holographic enchanted rose — which occasionally drops petals, just as film aficionados will remember from the movie. As fans will recall, much of the West Wing was torn to shreds in the movie by a distressed Beast, who despised his monstrous appearance; the West Wing of Be Our Guest similarly shows the Beast’s heartbreaking calling card. There is also the Rose Gallery, which is currently used only during lunch, when the restaurant is jammed with guests. This room is adorned by paintings of characters and scenes from the movie, and is anchored in the middle by a giant music box that depict Belle and the Beast dancing. Guests can meet the Beast in the Library. When I had planned to propose to my fiancée at Be Our Guest, I was much closer to the zero hour than 6 months. In fact, I had only 3 months, and by every early indication, there was no way that I was getting any reservations. The date was set for Veteran’s Day weekend, which also happened to be the last weekend of Epcot’s famous Food and Wine Festival. Seems like everyone in Florida was there that weekend. I managed to snag reservations anyhow. 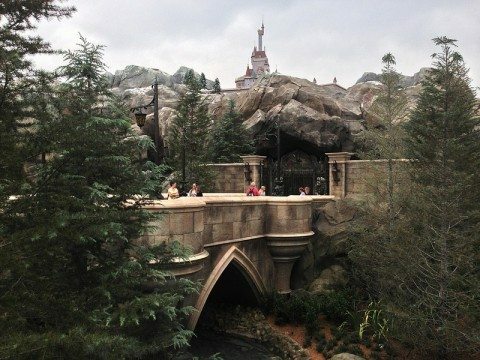 As it turns out, Be Our Guest will hold a charge against your credit card when you place a reservation, but will release the charge if you cancel your reservations at least 24 hours in advance of the date and time of your booking. So, these rules compel many people to cancel Be Our Guest reservations the week or so before their booking to avoid getting charged. A week before you intend to visit Be Our Guest restaurant, start checking the Disney Reservation site (also called My Disney Experience) throughout the day. Preferably, you should check on a frequent basis early in the morning, around lunch time, and in the evening. These times are when people are most likely to cancel their reservations. Call the Disney Reservation hotline at 1-800-828-0228 at least twice a day to see if any dinner times are available. Your chances of getting a Be Our Guest reservation increase particularly in the 72 hours before the date of your intended dinner, so be sure to call the Disney reservation line or check out My Disney Experience on a frequent basis each day. If you do plan to stay at a Disney hotel, remember that Disney lodge guests get 10 extra days to book reservations. That means you can book your Be Our Guest reservations 190 days out instead of the usual 180 days in advance. Stand in line for dinner – Arrive early and wait in line for a dinner opening. You may get in this way as reservations are sometimes cancelled last minute or forfeited. Try the lunch option – Be Our Guest restaurant serves lunch. There is sit-down service, but you order your lunch from fancy kiosks themed as scrolls; lunch items include sandwiches and salads. What you may find most pleasantly surprising about dining at this amazing restaurant are the prices. While many of the fancy Disney restaurants can cost $50 or more per diner, the menu selections at Be Our Guest are quite reasonable. Dinners range from about $15 to $30 per person, while lunch is under $15 each.